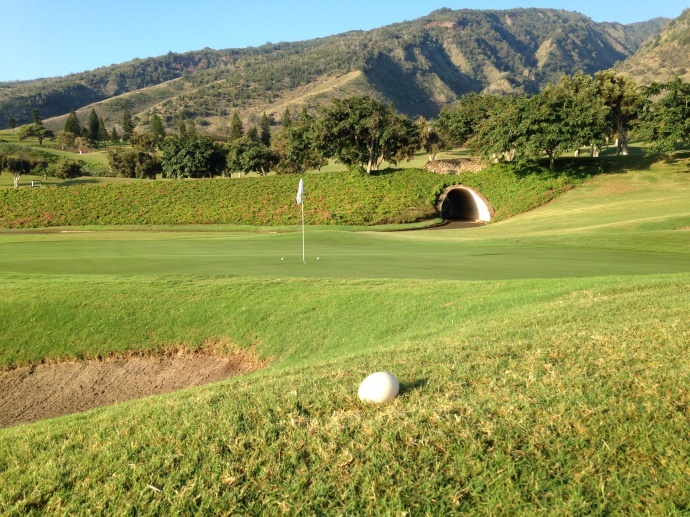 Nēnē goose egg at The King Kamehameha Golf Club. Photo by: Rick Castillo. 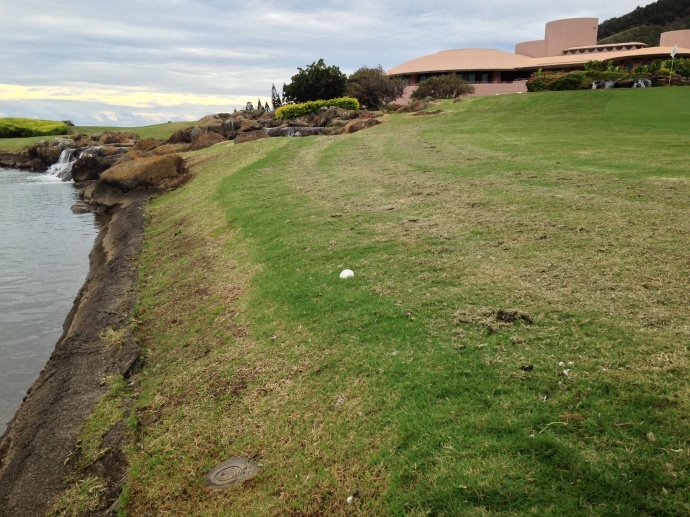 It’s too big for a golf ball and too early for Easter, but golf pros in Waikapū on Maui have identified the culprit of a white oval object on the greens this morning. 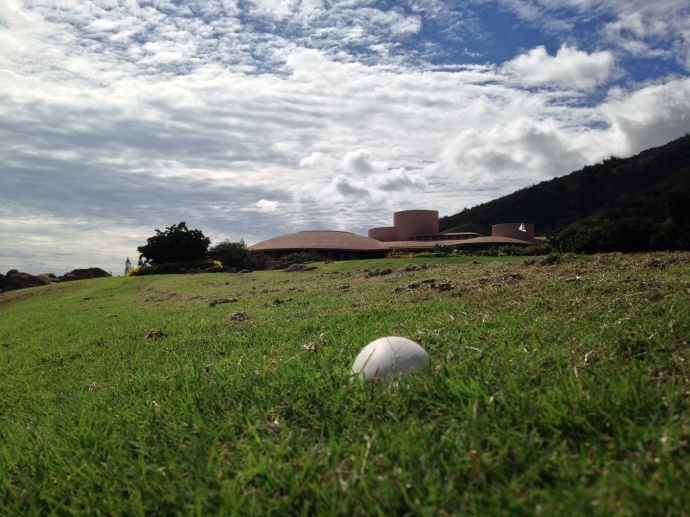 Rick Castillo, the Director of Golf at The Kamehameha Golf Club on Maui says the object is a nēnē goose egg, a sight that he has become familiar with over the years. He came across the latest goose egg while on the grounds of the course on Friday morning, Dec. 5, 2014. Those familiar with the area often seen nēnē flying and grazing; and there are in fact signs warning motorists of nēnē crossing near the facility roads. According to Castillo, there are 10 to 15 nēnē that frequent the ponds at The King Kamehameha Golf and Kahili Golf Course. Right around this time of year, the nēnē, which is an endangered species and the official bird of the State of Hawaiʻi, are known to lay their eggs around the ponds, with mates that they keep for life. “As soon as an egg is laid we call the Department of Land & Natural Resources and Wildlife, immediately. 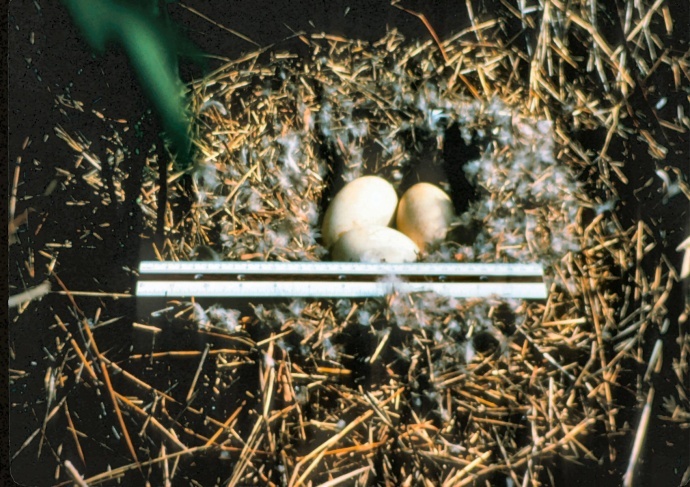 They come out and document the egg and place a three-sided box around the nest to protect them from golf balls and the weather,” said Castillo, who noted that it takes about a month for the eggs to hatch. Nēnē populations have been established in West Maui, at Piʻiholo Ranch on the Northern Slopes of Haleakalā, and inside Haleakalā National Park. 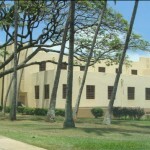 File image courtesy Haleakalā National Park Service. “One year, we had eight goslings hatch, but only four survived. The first week of the goslings are crucial as they are snacks for the mongoose and feral cats,” he said. 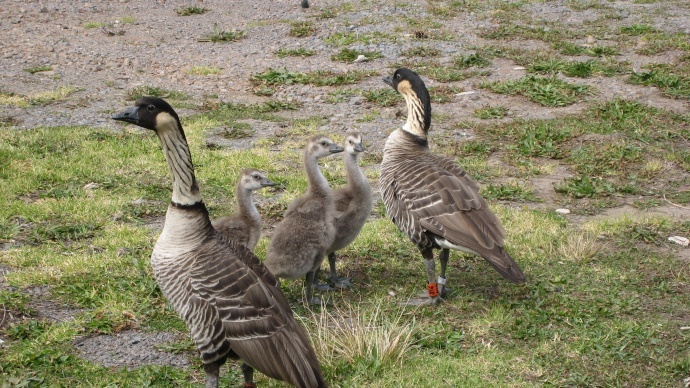 Castillo said employees of the golf courses train members and guests not to feed the nēnē, and keep them wild so that they can feed themselves by eating new grass shoots. “Sometimes, the young nēnē lay their first eggs and don’t know what to do, so many times the first eggs are abandoned. But, many times the female comes back and lays more eggs,” said Castillo. When this happens, he said, the mother nēnē will often stay and sit on the eggs. 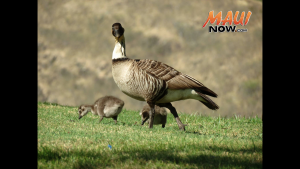 While the Hawaiian goose or nēnē is found in select areas around Maui year-round, they are most notably seen on Maui at Haleakalā National Park at areas between the 5,500 and 8,000 foot elevation. Their nesting traditionally begins around November, with hatching often occurring in December and January, according to earlier information released by park officials. In years past, the extended breeding season had continued into the months of March and April. Each year, motorists are reminded to be especially careful around shoulder areas of roads where nēnē are known to forage in short grass, and areas where there is ponding or pooling of water.